This is not a normal spiritual website. Tap (touchscreen monitors & phones) /click the picture below to watch the video overview of what you can get from this site. Video Transcript – click here to read, or can be read at the bottom of this page. This website and its contents will challenge your spiritual beliefs. This is a good thing. Those who want to awaken fast can. I have done it, I have seen others do it or found out how they did do it. In each video I also prompt you to enter Presence and practice, teaching you the skill set to succeed and live from happiness and joy that comes out of your inner Stillness. Those that disagree with what is in here either failed badly, thus can’t be honest with themselves or they didn’t know how to succeed (yet). 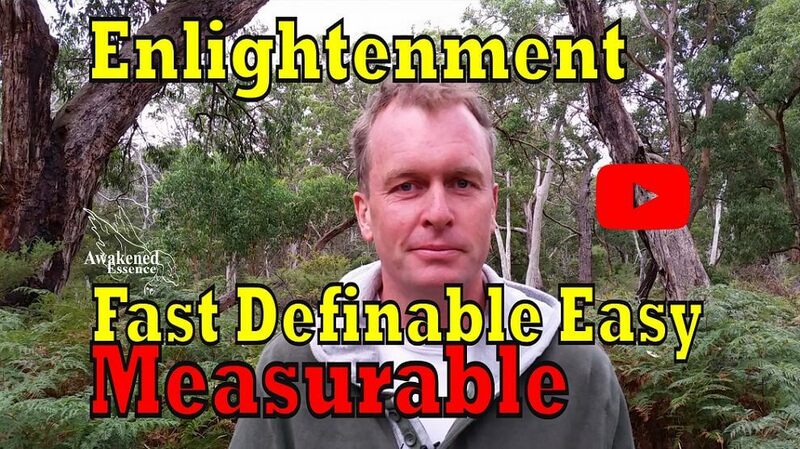 The video Enlightenment 101 below makes this process very simple, definable and do-able. It is for the new person to follow to start this journey, and the advanced student to see if its is true or not for themselves. There is a lot of depth packed into that video. To be able to experience the true Nothingness that is everything is a simple process and as you the reader work through the layers, you to will experience it. Failure is predictable. Failure is also the application of the Laws of Grace – they are provable in the positive and the negative. Spiritual failure is merely success at aiming to fail! Once these laws have been examined, it is a conscious choice if you succeed or not. It is just a matter of time, and that is mostly dependent on if you want to apply these laws and move swiftly and easily. Those that properly Awoke succeeded and did what is in this website in their own way. They may say they didn’t do what is in the videos and content here. But if questioned they still met the the principles laid out in the Laws of Grace. The Laws of Grace are the Laws of Success. This website has a spiritual focus so you can have a happy, joyful and peaceful life in this crazy world. The same laws apply to being good at tennis, earning money and fishing. The contents of this site needs to be studied and reflected upon. Re-listen to the videos, when I prompt, then “practice”. Save the ones that you resonate with and come back to them when life deals a toughie and you need to find peace, so you can feel good again. This needs to be applied and tested. Each of us is unique, yet the principles of consciousness are fixed and mathematical. If you are certain I am wrong send me a detailed email of how, and where you either succeeded or failed, as I’d love to know. You are your own Guru, you are your own Light. Use this website, its contents and personal mentoring if you wish to come home fast and successfully. The effort is worth it, I can say that from experience. To lose the Grace of a significant Awakening you had is a terrible travesty. Many people have these and they become a past experience, but the longing remains. It can be very shattering to lose a major Awakening. I had a major Awakening at the end of 1996. As I had no Awakened mentor who had real clarity, I lost it. A decade of sheer hell followed to learn what I could have found here in this website. That decade of hell is beyond price, its cost was huge. The financial, emotional and physical health cost was massive. But my learning from this can help you. You can avoid this cost and suffering of not being happy and come home fast and with Grace. Anyone can Awaken to what I define in this website as mid non-Abiding Awakening , as it is a conscious habit that anyone can apply. This level of Awakening is still quite rare, but you can live in this place if you choose. It is a conscious choice away. It can be added to any religious practice, faith or spiritual methodology. Awakening in 2 to 4 years to the level of mid non-Abiding Awakening is entirely possible. It will take a bit longer if you like to cruise. But Awaken you can! We can tailor you trip home to love, happiness and joy with a degree of accuracy. To find out more call Jason +61435522535, or make contact via the contact page. Click / Tap (touchscreen computers tap screen, mouse click won’t work) the picture below to watch why I cover both Awakening and the ‘Spiritual’ topics. Hi, I’m Jason. This website and these services are here to Awaken you Fast, to joy, happiness, Stillness, Presence, Awakening, Enlightenment, or call it what you like. That is living from that place “in the moment” where you have joy and happiness as your base of feeling, so its normal. This website gives you the skill sets and the abilities to enter Stillness and Presence when life is CRAP. When you’re having relationship issues, job issues, physical body issues like pain and all those things that life throws at you. These techniques are applicable, measurable, definable, and doable. This website will teach you how. The videos teach you, as I will prompt you to practice as I talk. The journey home can be FAST, if you take the direct path (No rubbish, no distractions – Direct). This website is based on that. It will have all the other spiritual stuff. It will have the energy healing, essences (AwakenedEssences), meditation and Inquiry. It will have how to apply this in the workplace. To use your job as you place of practice means you get to Awaken while you get paid for it! Most of all it has the access to me, with mentoring if you’re really serious about coming Home (yes – Awakening properly) to a fairly advanced degree in two to four years. So enjoy the videos check them out. Do what they say. Test it. It’s your wisdom you’re going to earn here! Listen to what I say try it out. Then you will know and you will learn for yourself what works and what doesn’t. So Enjoy. Enlightenment Explained: Here is how! 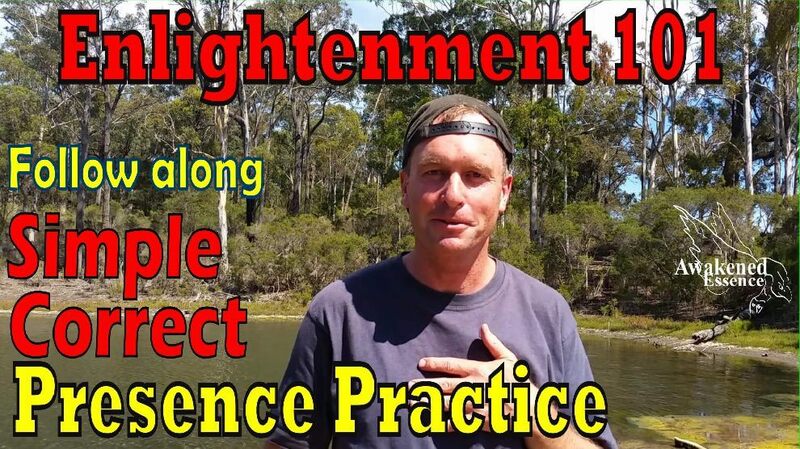 This video Enlightenment 101 is if for you to follow as I talk you through it. The unexplainable is defined, and you can live there if you just learn correct practice and follow simple principles. This video was made to answer a beginners question who found Eckhart Tolle’s explanations in the Power of Now confusing. It’s that simple. There is inbuilt complexity in this simple practice, hence a huge website to explain it. There are simple steps, there are layers you go through. As you practice and apply, you will experience what I speak about. In each video in this website and on my Youtube channel, I say this differently. Some will resonate and some may not. Test and apply until you have this as a default habit and you will Awaken fully. Its is mathematical. Thinking about it only, you will never Awaken. Debate the words and what another teacher said, you will never Awaken. Do it and Enlightenment is yours swiftly. Tell yourself this is “no doer”, you will never Awaken. It’s just a habit, too simple. The journey is a matter of learning to Be and undoing the bad habit of being lost. How do you fall into the habit of being Awake? By doing the correct practice, avoiding distractions and focusing into the body, rather than being lost in clever thinking. All this is explained in a video I titled “Who Am I” which is the famous question by Ramana Maharshi. Book a free 25min callback. Or book a heavily discounted session! Advanced spiritual healing practices and tools are available in this website. The Spiritual Path and its role in Awakening is discussed in the 3 paths page. Presence practice is the fastest way to Awaken. Spiritual activities take time and are much slower, unless you are Present first. The problem with most spiritual practices is they are not focused in Presence. Lip service is often given to Presence, but there is no application. If you apply what is in this website to your spiritual activities it will make a huge difference very fast. I state this throughout this website, so listen to what I say and decide for yourself. Well, if you have been on the spiritual path more than 5 years-are you abiding as Enlightened yet? There is your answer. The Laws of Grace are immutable mathematical principles. Hence, some viewers may discern a bit of sarcasm at times regarding spiritual activities – yet I offer extremely potent services based in spiritual practices. I spent an intensive 15 years doing intensive spiritual practices, it didn’t Awaken me, it certainly extended my suffering. The ‘distraction’, myths and wrong focus in the spiritual path is removed in this website. Use your strengths, apply correct focus on what works. It will make your spiritual practices an addition to your Presence practice. 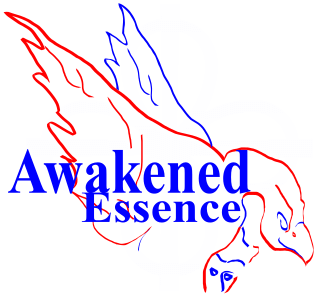 Learn and use Awakened Lineage Reiki and Golden Ray Healer as another way to deepen your Awakening. Energy healing can be used as another ‘portal‘ to quote Eckhart Tolle’s term to enter Presence. My affordable online courses are great for spiritual seekers to access healing energy. I teach these on the basis that Presence is first, as that makes Golden Ray or Reiki so much more powerful. If you are after personal one-on-one healing then I offer many modalities. All healing services are Grace based healing and are described on the healing page. The most potent being Phoenix Healing which is suited to major life changes or move something that is very stuck, that is only given after a thorough assessment and commitment is given as follow up is required. All Golden Ray and Awakened Lineage Reiki attunements are given via Phoenix Healing. Online services for personal Mentoring, Spiritual Bootcamp, Healing & healer training, Golden Ray healing, Reiki from a mentor with over 9 years of forever deepening Abiding (non-stop) Awakening. Nothing beats personal 1on1 sessions to resolve a situation, habit or to Awaken yourself so life is full of the good stuff even when life presents its challenges we all face. This is a rare opportunity for personal one on one with someone who walks this talk with clarity in life, in the corporate world and in the supermarket. Awakening clearly defined so you can awaken in 2 to 4 years to a deep stable level. Yes, it can be defined and is do-able. This website is all about having a life of inner peace easily. Being a slave to your mind and emotions is optional when you learn and use what is in this website. The Laws of Grace will guide you with clarity as to why your life is the way it is and how to change it by choice (ie: consciously). Clear, simple and applicable principles that can be applied so you can Awaken, Liberate or reach Enlightenment fast. Mathematically applicable laws that demonstrate what is required to come ‘Home’ to stable Peace, Joy, Clarity and be OK with life’s hard days. The Laws demonstrate why you succeed or fail at your goals, and spiritual progress. I speak about the Laws of Grace in most videos, that webpage is here and an online course will be here soon. Mentoring goes into these laws in depth. These laws or principles do actually give a timeline of how fast you will enter various levels of Enlightenment! Yes, there is a number that indicates how long it takes if you apply or not these actions and principles. Hence, why I say though out this website 2 to 4 years to mid non-Abiding level of Enlightenment. Math never lies, only humans do, hence self honesty is a key law! Be at your best in the workplace. Break the boundaries into inner peace, life balance and resourcefulness. Your job can be your Spiritual Practice to Awaken Fast. Learn a simple and profound way to meditate correctly. Direct entry into Presence and your Awakened state can be simple and quick. There are 2 follow along videos on the how to meditate correctly page to deepen your inner peace, stillness, Presence and connection to what You Truly Are. One is eye open or closed version, and the other is eyes closed. These meditations, step you through correct Presence practice in meditation. There are other meditations on the Youtube channel and more to come in this website (it’s growing!). In this website I help share an understanding of what Awakening is, what Enlightenment is. How the healing journey, working with healing energies or other beings, essences and things like that. How it all fits in the process of coming home to ‘Who You Are’. In this website I defined simply the Awakened State, Presence, Stillness, Buddha nature and all those words as you being consciously aware of the Stillness, of the Presence, of the ‘space that you truly are’, regardless of what’s going on in life. Regardless of how chatty your head is. Regardless of whether you’re emotional or not, regardless of whether you’re feeling of physical pain or not. What’s the most important factor here as you are aware of the ‘space that you are’ and that it’s embodied within your body. There’s none of this floaty stuff of being ungrounded, or energetically leaving your body with imagery. None of this thinking stuff so you imagine it’s real. No quoting other teacher’s material when it’s not my experience. If I do quote them it is because that is my experience for years, not just a fleeting moment. What I share with you here is for you to test for yourself if it’s true or not. By test, what I’ve done over the last 15 years, since I’ve lived in this place of permanent Presence, Stillness, Awakening, Enlightenment. For a full decade or more is I have tested these things relentlessly. A result of that is unique methods or teaching like the Laws of Grace. The Laws of Grace are immutable laws that will bring you home to Presence (Stillness etc) really fast. When you work with the Laws of Grace you work with remembering to practice. You apply the practice relentlessly and you will come home very fast. I say in this website 2 to 4 years to come home to a fairly stable level of Awakening. Few teachers are willing to say that! A level which I define technically as mid-non Abiding using Adyashanti’s terminology. This is can be read in the Awakening defined page. So my claim is exactly measurable as defined in this website – it isn’t a mindful creation. It’s fairly possible in two to four years to live in a stable degree of non-stop Presence. By then you have wiped out what Eckhart Tolle calls your ‘pain body’. Yes, you will still have emotions, this is a misunderstanding if you think you won’t. See this video on emotions. Yes, you all still get angry. Yes, you will still have personal baggage to work through. It’s a complex thing being a human being. We are very deep, we have a lot of stuff, but you can do it from a place of Presence. I’ve been living in this place of Stillness for over a decade. In this decade it has deepened immensely. In that time my healing journey hasn’t stopped it’s still going. If you think one day you’re going to fall out of bed and be Enlightened and all your stuffs gone… well, good luck! So many people think they are that lucky one. If you know and you are resonating with what I’m saying here maybe this website and what it has to share is going to help you if you really want to come home fast. Make contact and consider going into a coaching / mentoring program. Where you can clear out the stuff really fast know how to apply yourself so you come home fast for the betterment of you, the betterment of your family, your friends and all of humanity. Realistically if you apply yourself because you keen, and seriously, how keen are you? Because it is quick took me five years and that was with the assistance of teachers with the assistance of listening to Eckhart Tolle’s teachings. After I was fully Abiding I listened daily to Adyashanti for 1 to 2 hours for the first few years! But from where I am now I know I can help you do it way faster. Two to four years to a fairly stable level of Awakening. Then once you’re that that place it’s pretty smooth after that until you actually hit the Abiding place and it never leaves! However, Abiding Enlightenment is always a bit of a shock. Then there is another process you’ll go through where you will you maintain your Stillness / Presence from the place of vigilance. The Laws of Grace will still apply, if not more so, because as you have that capacity to be in Presence and that amplifies things. The journey is amazing, it can be fast and it can be smooth when you’ve got someone one-on-one who’s trodden their path before you. That may be me so if you’re interested watch some of the videos. Make contact and we will chat it over. Then if you like we’ll go into mentoring and bring you home really fast. It is doable the only question is are you keen? You can do it with the content of this website and the teachings of people like Adyashanti and Eckhart Tolle IF you stay focused. I did that through being focused. There you go; it is possible anyone can do it. Few people manage it, firstly because they’re not keen. Secondly, because they don’t understand the laws, the Laws of Grace. Thirdly, because they don’t apply the practice relentlessly. If you have those capacities and want to come home we can do it. I’m Jason please make contact and we’ll have a chat, call me per the numbers on every page of this website! And yes, the Phoenix pictures in this website are all 100% real, and are not altered. The Phoenix Logo is anatomically correct when overlaid with a Bald Eagle. 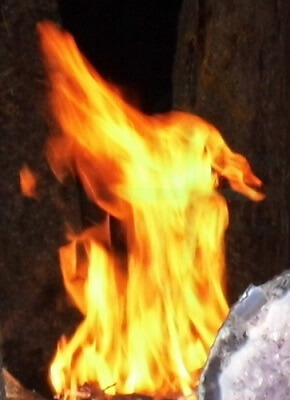 The Phoenix’s head is bigger but beak, eyes, nostril neck, wings and even the claws are in the correct spot in the flame. Unexplainable but true, especially when I have taken over 10 Phoenix photos. Spirit has a message that is: You can Awaken, as the Phoenix is in all of us. Wake up, its a choice. Feel your Spirit calling. Rise from the ashes. Act on it.